Don’t dismiss the importance of your dining room! The dining room, more specifically, the dining table is the centerpiece of family discussions. It is the place we come together to converse about our day’s happenings, plans for the weekend and to congratulate each other on a job well done, or a great report card. 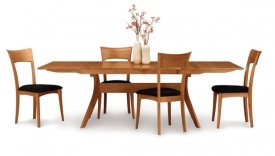 All the more reason to have a quality dining table that stands the test of time. At Riley’s Real Wood Furniture of Eugene we believe that a great piece of furniture can make these memories even more special. What Material will you choose? We here at Riley’s Real Wood Furniture of Eugene always recommend a strong solid hardwood option such as Cherry, maple, oak, elm, or walnut. You want to choose materials that will last generations, not a few years like a cheap imported veneer table would. What type of finish is best? 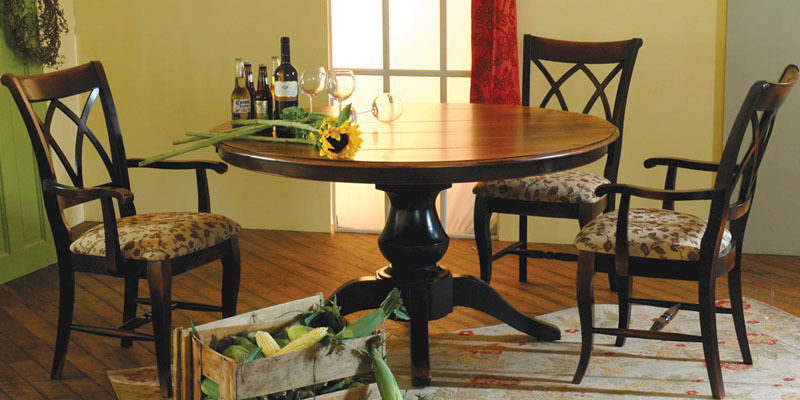 A quality finish can help to extend the life of your dining table’s look and stain, by protecting it. We recommend conversion varnish. It is an exceptionally durable finish with excellent protection against water, heat, solvents, and other chemicals, making this an ideal finish for a tabletop. Luckily, every single table we offer has this high quality finish! How much space do you have? A quick measurement of your dining room is almost as important as the style of table you choose. Whether you’ve gone with a rustic farmhouse style or a more modern Trestle style dining table, if it doesn’t fit, what is the point? Do you have company over regularly or intermittently? If you regularly host visitors or throw dinner parties, you should choose the largest table that will fit in your dining room space. Otherwise choose from one of our many tables options with leaves, which can fold and expand as needed. When it comes to choosing seating for your dining room and dining table, Riley’s Real Wood has sets and individual options to choose from. We highly recommend you take a load-off and sit for a bit in our comfy chairs and really test them out. Your family and guests will be spending a lot of time sitting and relaxing in these dining chairs and if your family dinners last as long as ours, you’ll want to ensure that the chair you choose will be comfortable for long periods of time. If you have a smaller space to work with, Riley’s Real Wood Furniture of Eugene has you covered! 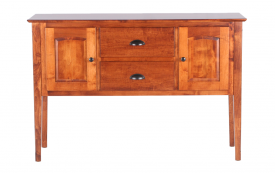 Conquer your small space with the use of benches, casual dining sideboards and hutches. Hutches not only are great for storage but as a formal display for fine china and holiday decorations. Benches are great for when your friends and family come over with their kids, as you can slide a bench in and really make great use of a small space. Hopefully this guide has been helpful in your decision making process, and remember, if you are having trouble finding a table that compliments your home’s décor while serving your family’s dining needs, you can always call or come into our store. 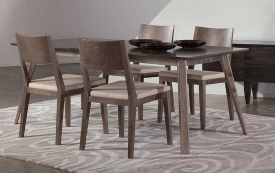 Our highly trained staff is happy to walk you through every step of the buying process to ensure you leave with a dining room table or dining room set that will stand the test of time. Riley’s Real Wood Furniture proudly serving the Eugene, Springfield and Willamette Valley’s furniture needs for over 30 years! We Carry The Brands You Can Trust - Country View Woodworking, Wood Castle, Lyndon Furniture, Best Home Furnishings, Omnia Leather, Fjords by Hjellegjerde, Precedent, Trend Manor, JenCo, Adesso.